<P>Just in time for for your next project. Paasche air brush. Chicago air brushes shipped same day if required out of the Chicago area. This is the air brush most in demand by working professionals for painting T-shirts and vehicles. It's based on the same action as the Model V air brush, but it's physically larger. This siphon-feed, double action, internal mix airbrush can spray heavy fluids such as textile paint, auto lacquers, and enamels. Paasche's Model VL air brush is available with three different multiple head assemblies. 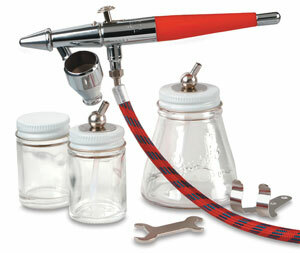 The Paasche Model VL airbrush is suitable for both left- and right-handed users. This bush is commonly known as the "Chicago" air brush because of the quantity sold throughout Chicago.